JeepForum.com > Vendor Display > Vendor Giveaways > Monthly Giveaway! Break those winter time blues by signing up for our monthly giveaway! 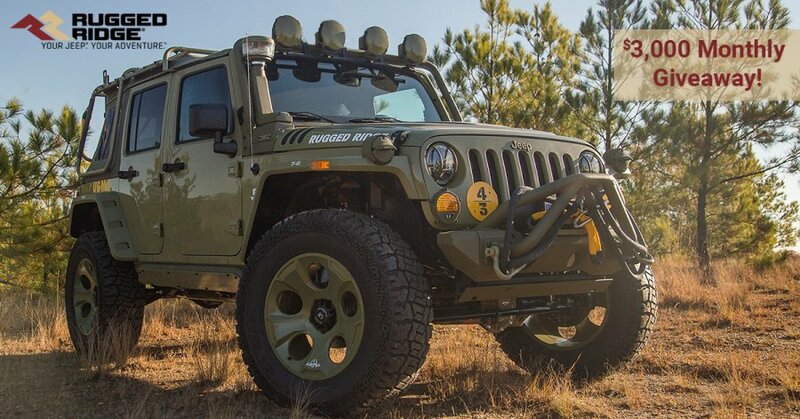 We'll be giving away $3,000 worth of Rugged Ridge products! 1st place wins $2,000, 2nd place wins $750 and 3rd place wins $250. Winners will be selected at the beginning of next month! Just sign up HERE to enter. A link to the rules are posted on the contest page. You could try reading them. You couldn't think of a nicer way to word that? Don't ya think you're being just a little hard in the guy? Um, no. That WAS the nicer version of that post. Out of respect for Quadratec (a great company), I softened that post up a bunch. I don't reward laziness with kind words. A link to the rules for the contest are right there on that page, he was just too damn lazy to read them. LoPhat and daddyjeep87 like this. You refuse (or are incapable) to read some simple contest rules, yet I'm the ignorant one. Gotcha. If bashing fellow members is your thing then so be it. Each to their own. To start with if you just didn't want to answer it appropriately then you should have left it alone. That would have been the mature thing to do. But the ignorance in you came and you felt Entitled to belittle someone and you now feel justified in what you did. If this makes you feel good, then okay. Good on you for all the previous advice you have given, shame you couldn't have been as caring for another Jeeper, that just tossed all the good away in my book. I have called Quadratec and voiced my concern over the sort of representative that they have in you with your concern for them by answering their questions. You have a great day. LoL. I am not affiliated with Quadratec at all, I do not represent them in any way, shape or form and they have no control over my postings. But hopefully you feel better after whining to someone about your hurt feelings. BTW, I did in fact answer your question in my very first reply. Sorry if your skin isn't thick enough to take some mild criticism for your extreme laziness. If you're going to be posting anywhere on the internet, you better grow a thicker one. Stop it now. Personal attacks are not allowed here. Some of you should know better.